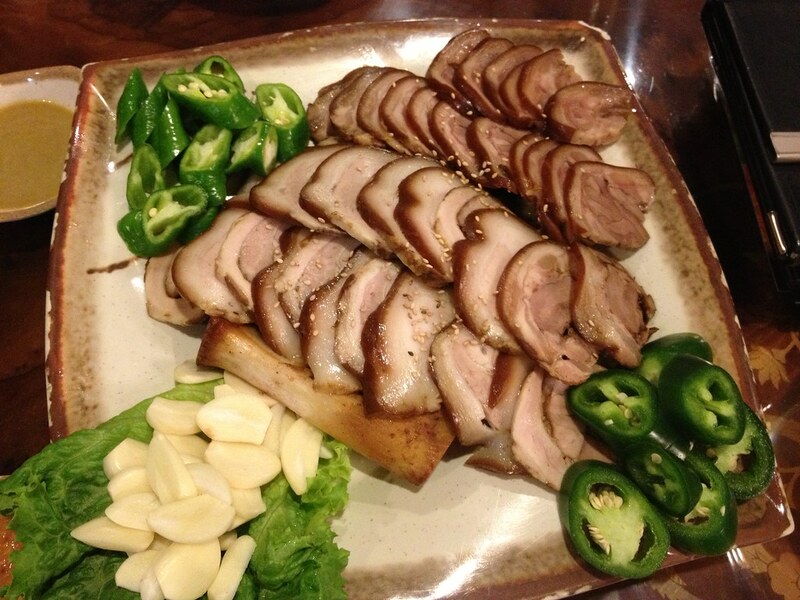 Song Cook’s is one of my favourite Korean restaurants in “Toronto”. Even though I live in North York and have a plentiful selection of Korean options near me, I will happily go North to visit Song Cook’s whenever the suggestion is made. 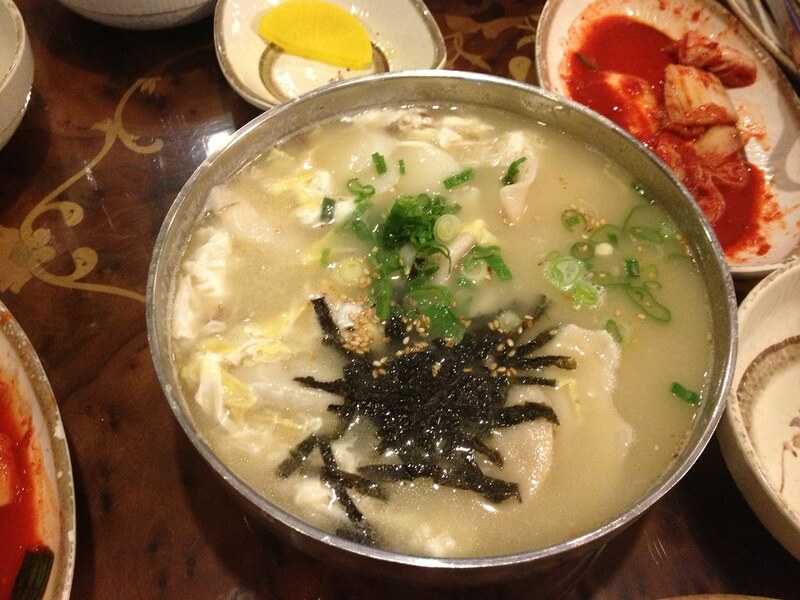 Their menu has a wide assortment of dishes outside the typical Pork Bone Soup, Tofu Stews and BiBimBap. 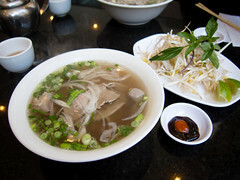 Atmosphere: The restaurant is very spacious and great for large groups. I’ve had parties of 18 people and the restaurant was great with setting us up in a private area with large tables. There is also a dining area where you can sit on the floor without shoes if you don’t have bad knees. The decor uses a lot of different woods and the serving ware consists of beautiful clay plates with the stone pots alongside stone pots and sizzling plates. Service: Every time I’ve visited Song Cook’s, the service has always been top notch. Food arrives quickly, it’s easy to flag someone down and everyone seems genuinely happy to be at their job. 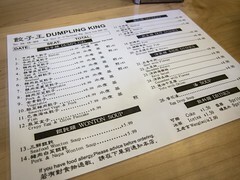 I’ve asked a lot of questions about their menu, and someone always patiently explains the dish to me. They’re also able to provide separate bills for large groups. 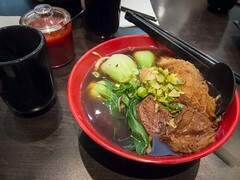 Food: I’ve tried a few types of ordering at this restaurant, sharing mains, ordering entrees and also their set course. 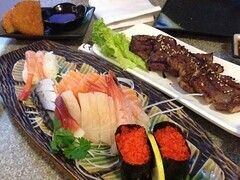 On my most recent visit, half of our party arrived and were starving so we decided to order a few entrees to share. When everyone else arrived, we ordered more, more than enough and we still finished everything. I really like the kimchi that Song Cook’s provides as a side dish. They actually provide scissors and tongs for you to cut up the pieces of cabbage and radish yourself as the full leaves are served. 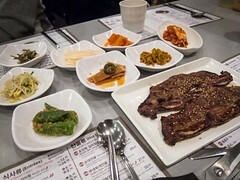 We started with the JokBal, which is thinly sliced pork leg served with three different sauces (a peanut, a seafood one and a spicy red one), raw sliced hot peppers and garlic. The meat was really tender, and the fat and skin was glazed and a great chewy texture. 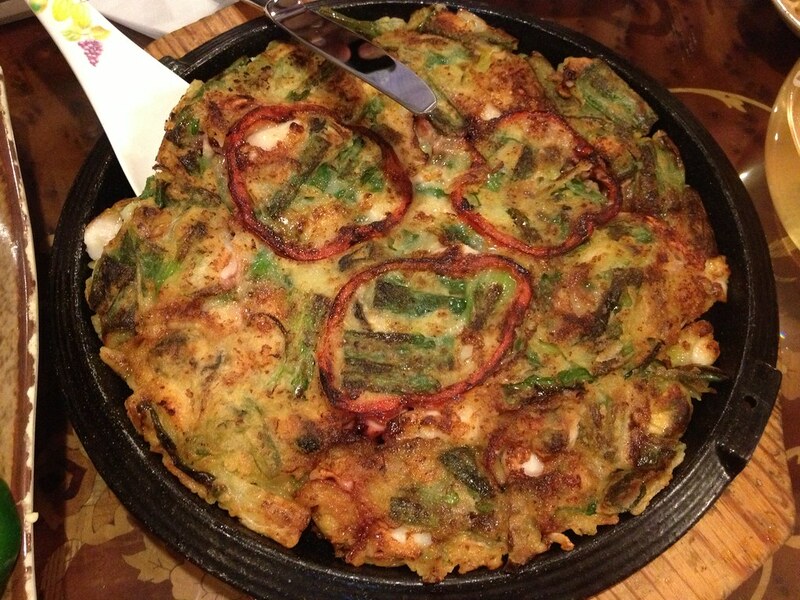 Next was the seafood pancake that was full of fillings and had a great crisp on the surfaces. Every Korean meal has to have some kind of stew, usually my favourite part, and we ordered the dumpling and rice cake stew to share. The service was great and brought a ladle and individual bowls automatically. The dumplings weren’t overcooked or soggy and the homemade skins made a big difference. 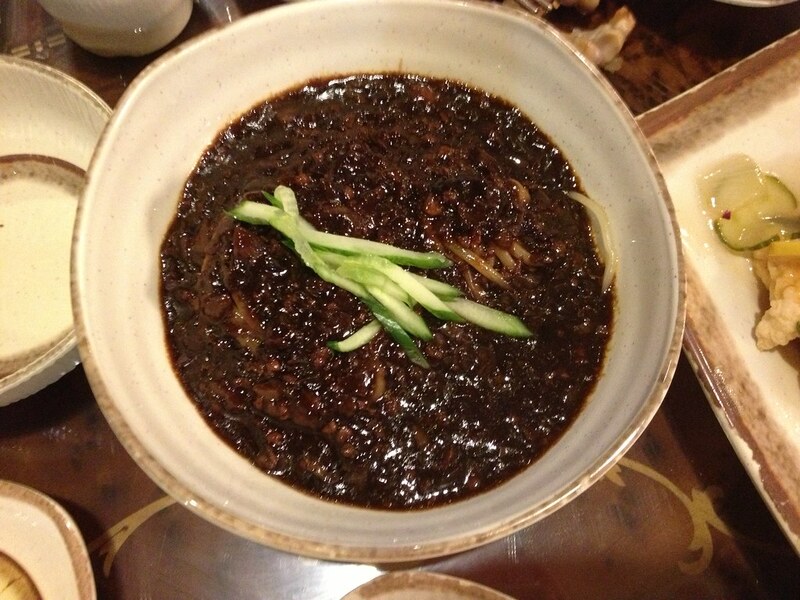 One of the dishes that is most well known at Song Cook’s is their “black” noodles, or JaJangMyun, which is a mixture of black bean sauce, vegetables and ground beef. I love the texture of the homemade noodles used in the dish, thick and round but with a texture more like udon than rice or flour noodles. 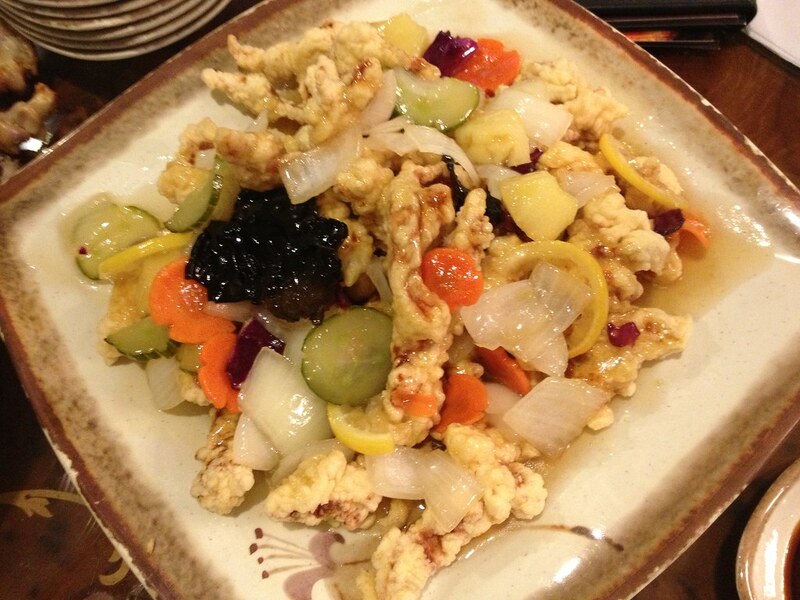 On top of this, we finished off with the TangSuYuk, a Korean-style sweet and sour pork. The pork is battered and fried, there is a lot of vegetables in the dish but the sauce can be a little overwhelming. If there’s a piece left soaking, it will be very sweet. All of the food and our bill came to only $20 per person. With so many menu options that are different from a usual Korean restaurant Toronto, I highly recommend trying something new.